A-135-4A is the main module. 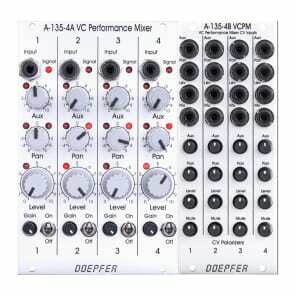 It is very similar to module A-138p, but with voltage control for all parameters (except gain). Also the front panels of A-135-4A and A-138p are very similar. The only difference are the additional LEDs which are used to display the magnitudes of all voltage controlled parameters. This is necessary because the positions of the manual controls do not necessarily correspond to the resulting parameter value because these are composed by both the manual controls and the applied external control voltages. Without the LEDs one one be left in the dark in regard to the actual parameter value. 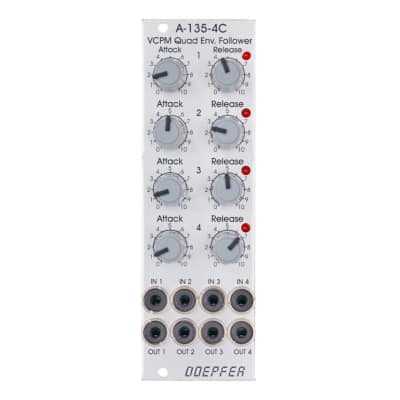 A-135-4A contains four voltage controlled amplifers (VCA) for each channel: one for the main level, two for panorama left/right and one for aux. Altogether 16 VCAs are included in the module. High end VCAs manufactured by Curtis/USA are used (CEM3381). The 16 LEDs display roughly the amplification of the VCA in question. NOTE: Price stated is for module combo; A-135-4A and A-135-4B.